A force that cannot be contained. A visit to the island of Maui a few weeks ago reminded me of the importance of ‘recharge’ breaks in life for staying centered and nurturing my artistic spirit. Maui had been an annual stopping point for my husband and I for many years. A little condo complex perched on the western shore offered an easy resting spot for us where we could quickly slip into a laid back routine. However, life has a way of intervening and it had been three years since our last visit. It did not take long after our arrival for me to remember just why we had spent so many years trekking out to the spot annually. 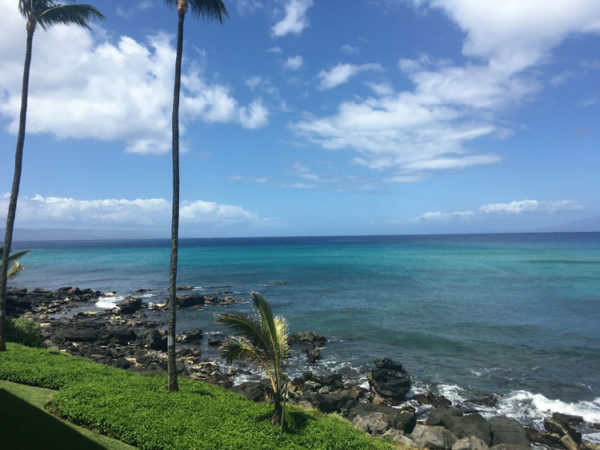 It felt as though the crashing waves outside our lanai were washing away tensions in my body. As I sat watching whales frolicking in the ocean, I realized the inspiration for many of my art quilts had emerged in similar moments sitting on a Maui lanai. The setting was a vehicle for me to nurture my own centered state akin to recharging a battery. Back home on the mainland, I continued to play with the concept of recharging center. I began to identify and more fully appreciate the places in my travels where that feeling of ‘recharging’ was strongest and that I intuitively longed to return. I found each conveyed a deep feeling of peace that nurtured my creativity even though the locations varied significantly in landmark characteristics. 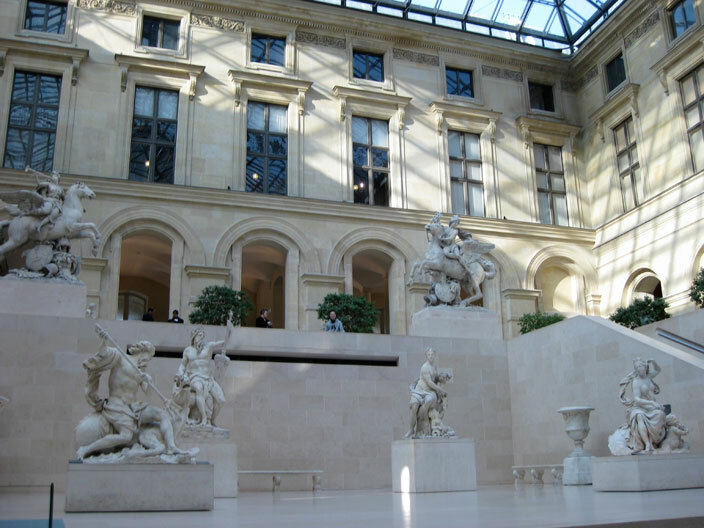 High on my list were two sites in busy Paris – the sculpture gallery of the Louvre and the restored home of Rodin that displays many of his works. 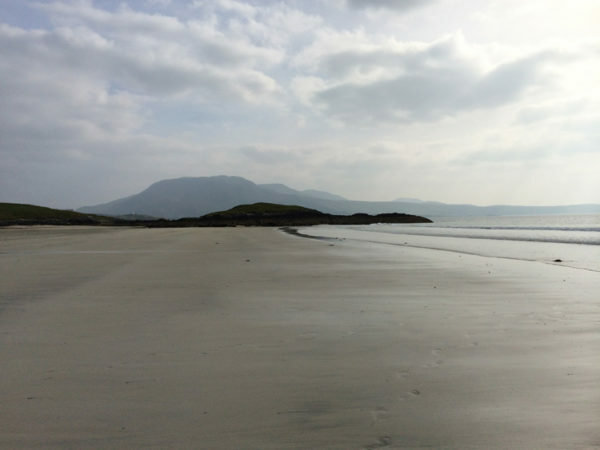 Other ‘recharging stations’ for me were in more remote destinations: a beach on the west coast of Ireland, the ice in Antarctica, a mountain top perch in western Colorado. Fortunately, these places are not the only way for me to recharge. 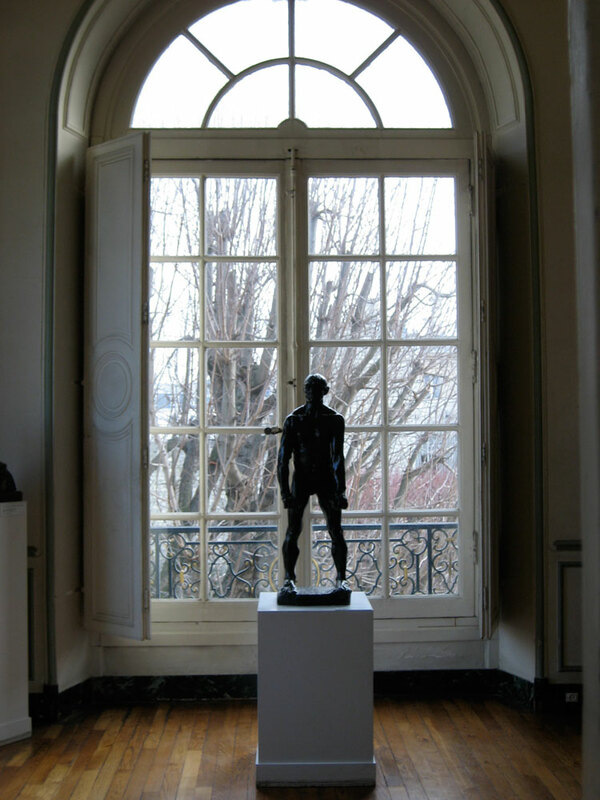 Daily meditation is my ‘at home’ go to for starting off a day in a balanced and inspired state, and sites such as the Seattle Art Museum, much more accessible than Antarctica, are guaranteed to recharge and inspire me. However, my Maui trip has reminded me of the importance of scheduling visits to some of those more distant magical places as often as possible. In fact, next year is already booked! This week I am delighted to be participating in the Around the World Blog Hop. I was invited by Deborah Lynn Stanley and you can read her blog hop post here. The theme of the hop is to answer some questions about our creative process. I found it a great opportunity to stop and consider my own artistic journey so here goes! 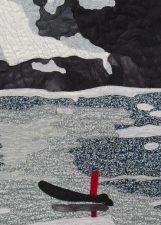 I have been working on art quilts for about seven years. Late last year I began to study hand stitching with Karen Ruane. I am currently taking a class entitled Simply Stitch 5 with Karen. It is a free form class via the internet where the student is a ‘fly on the wall’ in Karen’s studio while she works. You have a choice of working on what Karen is working on or doing your own thing with feedback from Karen and other students. We use Flickr for posting photos of our process and receiving comments. I have found that this approach to learning works wonderfully for me. I travel back and forth between upstate New York and Spokane Washington regularly so I need a flexible learning arrangement. 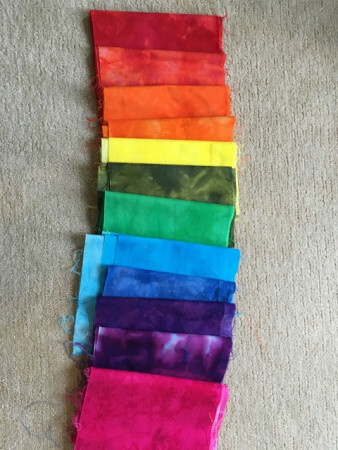 As part of Karen’s class, I have just started to create a cloth that will be comprised of men’s handkerchiefs embellished with feminine touches. 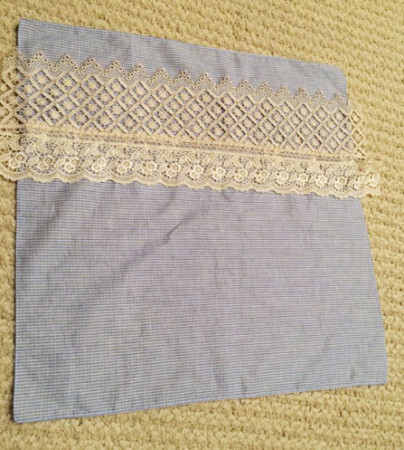 I have just finished my first ‘block’ which added lace trim and french knots to a blue handkerchief. 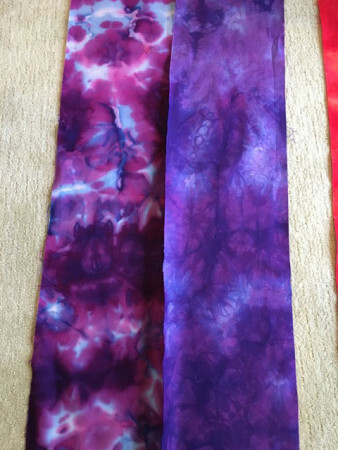 I love the color combination and the feel of working with these fibers and am going to be really curious to see how this develops as I embellish more handkerchiefs! I always have an art quilt in process and have been working on a piece on deforestation for an upcoming Call for Entry. I don’t usually work on pieces for specific Calls but this was a topic that interested me and so I used the Call as an opportunity to make a statement through my art. Here is a peak at one of the ‘ghost trees’ that I have designed to wander through a devastated landscape. I have hand stitched mulberry paper backed with roving onto a hand dyed organza background. Hmmm. 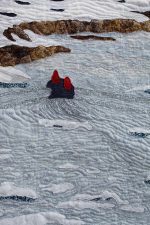 My art quilts are reaching out more and more beyond the use of cloth fibers to get the effect I need. 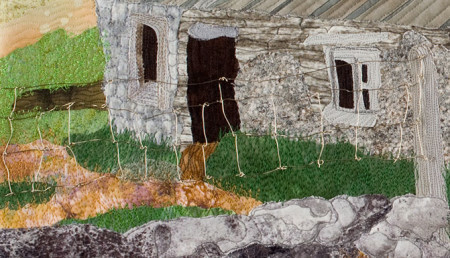 For example, in my art quilt, Roots, I use wire for the fencing near the cottage. That is simple: – to make a statement. It may be about something I observe in the world. Often, I am capturing a moment in time either from my travels or my life that had significance to me. I hope that my art will touch others and invoke emotion in them. My art is my means of reaching out and communicating with others. 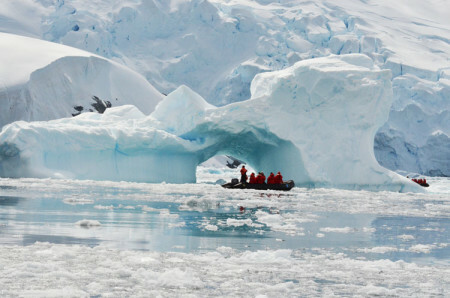 A trip to Antarctica a few years ago is a great example of how my travels have inspired my work. I was deeply touched by the beauty of ice in that intriguing world. 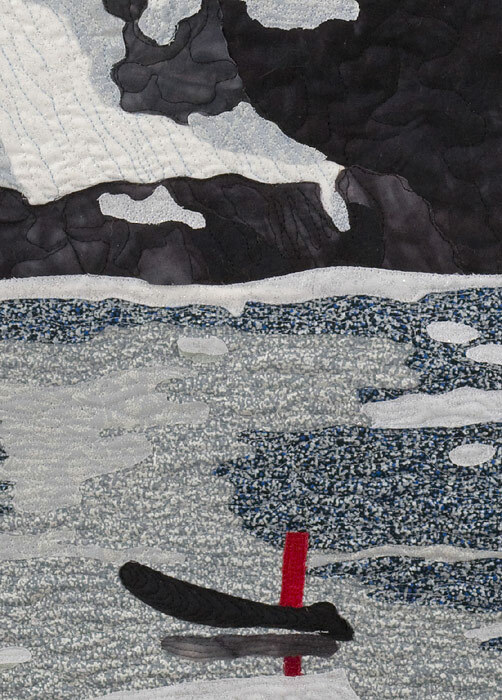 To date, I have created a number of art quilts out of my Antarctic experience and I am sure more will surface. Journey is a good example and you can find others here on my website. How Does My Wriitng/Creating Process Work? Ideas for my art often come during meditation. I also take a lot of photographs as I travel. Something in a photo will capture my attention – it may be the light, certain shapes, or the overall essence of a particular place. Over time, I get a clearer image in my mind of what a particular piece might look like. From there I will either begin sketching with an idea of creating an art quilt from unique fibers, or I may decide to play with a photographic image in Photoshop with a goal of printing the image on cloth for stitching. At some point along the way, the art work itself ‘takes over’ the creative process. I listen to it as I work and follow the direction it dictates. Sounds crazy but if I don’t listen, I grow intensely dissatisfied with the piece. Jeanne Marklin – Jeanne and I both have a passion for travel. We attended SAQA’s annual conference in 2013 together and I quickly appreciated the depth of her knowledge of the fiber art world. 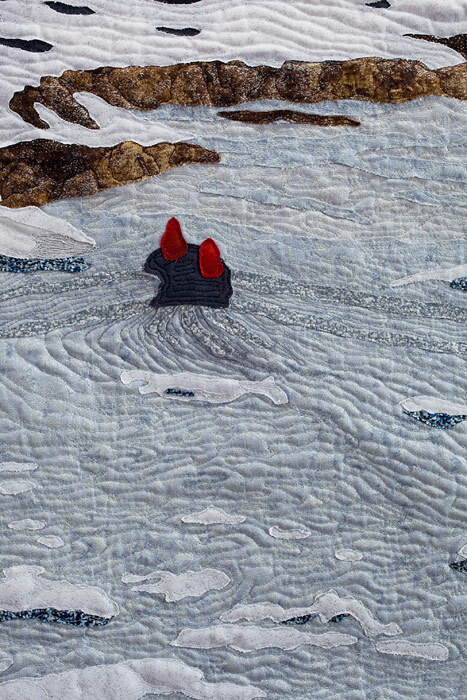 Her art quilts are stunning and she is masterful dyer. Be sure to check out her blog and her website today and again next week. 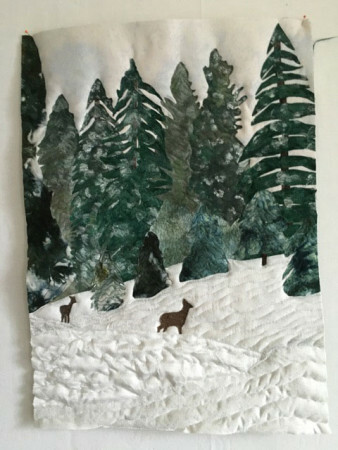 Diane Miller – Diane and I are members of RAFA, Rochester Area Fiber Artists. 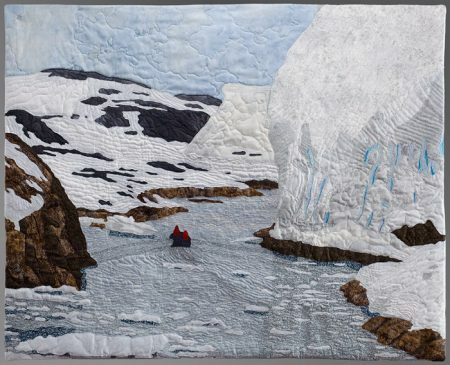 She is constantly exploring and creating amazing art quilts and jewelry. You can see examples on her blog. Regina Dunn – Regina and I met over the internet as we participated in SAQA’s Vision Project. I love Regina’s enthusiasm to explore new methods and her talent to in writing about her process on her blog. She will be writing a post for the hop next week. In the meantime, you can see some of her work on her website. I hope that you all enjoy this opportunity to explore what all these amazing artists are accomplishing. Fused appliqué art quilt with machine quilting. There are no trees in Antarctica, no greenery. If you are fortunate enough to ever visit the continent, the vastness of its glaciers, mountains, and waterways will forever humble you. 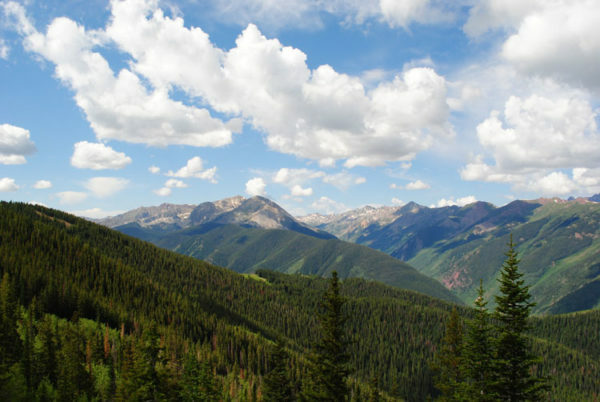 The number of species that can survive in its climate are few. Man is a visitor who quickly learns to respect the forces of nature at work. The scene depicted in this representational quilt was adapted from photo taken in this land of ice. 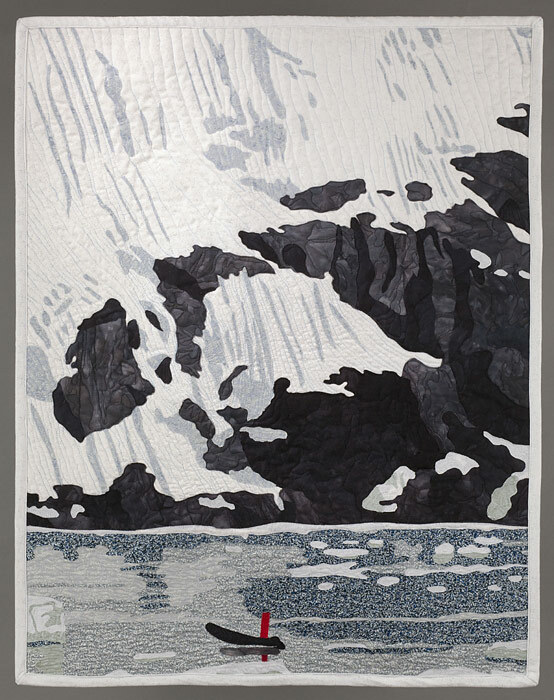 The scene depicted in this fiber art quilt occurred on a Christmas Eve in Antarctica. Some volunteers who had been restoring a deserted hut were stranded by an influx of ice into a previously open waterway. The ship that I was traveling upon had the ability to cut through much of the ice. We then sent two Zodiacs up a channel to pick up the volunteers and transported them to Port Lockroy to spend Christmas with friends.